booklet Archives - io design & illustration, inc.
Now in it’s third edition, the Asheville Wedding Guide is one of my favorite design projects ever. 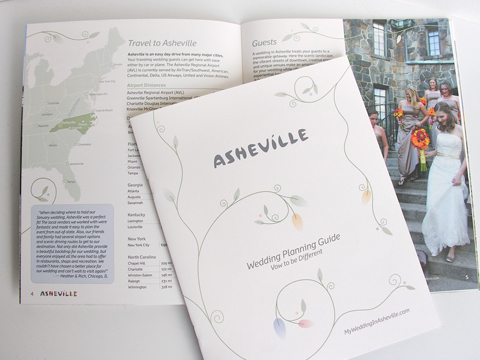 The first edition was created for the Asheville Convention & Visitor Bureau (CVB) in 2009 as they were stepping up services for destination weddings. The guide needed to include the normal content you would expect – lists of photographers, locations, caterers, spas and all other local wedding related resources. But the goals for the guide went beyond that. We needed to create a piece that spoke of Asheville as an unique place to hold a wedding, a piece that evoked the beauty of our area and the wide variety of activities that make it a wonderful place to ask friends and family to gather. It also needed to tie in to existing CVB branding, which includes a fun, bold color logo, while maintaining a romanic feel generally associated with softer colors. I am please to say that the initial edition won the 2010 North Carolina Destination Marketing Achievement Award: Gold for Best Niche Marketing piece. And brides-to-be have blogged enthusiastically about the piece, as well as the excellent service from CVB staff they have received with it. Always nice to know a design has hit the mark! Why is the piece one of my favorites? Because it merged illustration so nicely with the layout of a lot of detailed information. There were lists and tables a plenty, but throughout I wove delicate vine illustrations and enhanced pages with photos and quotes. We also chose to print on a natural soft white uncoated paper. The end result is a piece that is very beautiful, extremely functional and has a warm welcoming feel.